Three carpenters played a big role in the life of Richard Wurmbrand, an international representative of—and voice for —persecuted Christians in the twentieth century. One of them was a praying carpenter. The greatest of them was the Carpenter of Nazareth. The third was a godless carpenter. The first helped him to the Greatest, and it was for the glory of the Greatest that he met the third. Something irresistible drew Richard to that village. He had nothing to do there. Romania has thousands of villages. But Richard went to that village. Seeing that he was a Jew, the carpenter showed him love. He saw in Richard the answer to his prayer and gave him the Bible to read. Richard had read the Bible out of cultural interest many times before. But the Bible that the carpenter gave him was another kind of Bible. Richard later learned that the carpenter and his wife prayed for hours for his conversion and that of his wife. The Bible given to Richard was written not so much in words, but in flames of love fired by prayers. Richard could scarcely read it; he could only weep over it, comparing his bad life with the life of Jesus, his impurity and hatred with His love, and He accepted him to be one of His own. Soon after Richard, his wife was converted. She brought other souls to Christ. Those other souls brought still more souls to Christ and so a new congregation arose in Romania. Richard had begun a journey with the Son of God, Jesus the Carpenter of Nazareth. In 1944, Communists seized power in Romania and Wurmbrand was sent to prison four years later. Labelled “Prisoner Number One”, he was placed in a solitary cell. After eight-and-a-half years he was released, but then re-arrested a few years later and imprisoned for a further five. The suffering was intense. Deep beneath the earth, Wurmbrand and fellow believers in prison saw none of creation’s beauty—no sun, no moon, no stars, no flowers, no rivers, no Bible, no book, no child. They saw only the prison wardens and torture. The cells were soundproof. Perfect silence reigned there. There was almost nothing to eat. There was no colour, only the grey world of the prison. It was an exceptional circumstance. When Richard said, “You, Lord, speak to me,” he heard the voice of Christ. His sheep hear His voice. Christ Jesus posed a striking question: “What is your name?” He asked. He feared too to say “I am a Christian,” for first-century Christians had gone to their death under the Romans saying “Christianus sum” [“I am a Christian”], and he was not as courageous as them. Years of prison passed. The Christians faced hours of brainwashing daily. And they were hungry, hungry for Holy Communion, the remembrance of the broken body and shed blood of the Lord Jesus Christ. For years they had not celebrated it—and yet, they had nothing. At once, the Christians had an illumination. They had! They had something called “nothing”. What was the value of this “nothing”? The prisoners had nothing and were nothing to the wardens. Yet in those half-dark, subterranean prison cells, they began to think of the value of the “nothing”. The beautiful world, the wheat, the vineyards—God had made them out of nothing. So “nothing” was a very valuable material, indeed, the basic material from which Holy Communion was made. And in Job 26 it says that “God hangs the earth upon nothing”. “Nothing” was therefore the most resistant material upon the earth. To have “nothing” was to have something very valuable and resistant. Then also there was St. Paul, who said “I am nothing”. If Wurmbrand was nothing, then he was like St. Paul! The Christians decided that they had been foolish not to rejoice in having and being nothing, and that on a Sunday morning they would take Holy Communion—with nothing. Having signalled to each other on the cell walls, they took in their hands “nothing”, and thanked God for it. “Christians are simply thankful and grateful,” Wurmbrand later remarked. They blessed the nothing, the beautiful nothing. They remembered the body of the Lord Jesus Christ, which had been broken for them; and then they took another “nothing” and blessed that, too. “When you are a child of God who takes a cross upon himself,” Wurmbrand continued, “and know, ‘I am a nothing,’ it’s much too big a privilege for me even to say that ‘I am a cross-bearer’. I would not dare to shout loudly ‘I am a Christian’, because I know what a great thing [it] is to be . . . a Christian. Then God takes possession of your soul, Christ reigns in you”. One night, Wurmbrand was interrogated by a colonel of the Communist Secret Police; the colonel’s name, in English, meant “carpenter”. He threatened to shoot Wurmbrand if he did not betray all the secrets of the Underground Church (the Church of the persecuted). “Never will I release you! Let Him, what is His name, release you! Never will you see Westminster Abbey!” shouted the colonel. Years later he was released, but the colonel placed in prison—and Wurmbrand did see Westminster Abbey. There he bought a card and sent it to the former colonel: “Do you remember what you said to me? . . . Well, He has released me,” wrote Wurmbrand, “He’s Jesus, He’s the Son of God, and I’m now at Westminster Abbey, and He can release you too, and you should also believe in Him, and if He wishes, you can even see Westminster Abbey,” he wrote. Jesus the Carpenter gave His life gladly for us, even singing to Gethsemane, the garden of agony. And He is coming again. 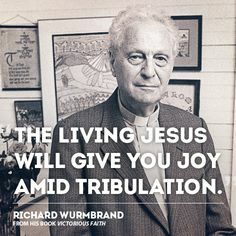 —See Richard Wurmbrand, Tortured for Christ and “The beauty of nothing” (recorded address).